Renowned for his beloved and acclaimed children’s books, Maurice Sendak (1928–2012) was also an avid music and opera lover. In the late 1970s, he embarked on a successful second career as a designer of sets and costumes for the stage. Drawing the Curtain: Maurice Sendak’s Designs for Opera and Ballet will be the first museum exhibition dedicated to this aspect of his career. It will include storyboards, preparatory sketches, costume studies, luminous watercolors, and meticulous dioramas from Mozart’s Magic Flute, Janáček's Cunning Little Vixen, Prokofiev’s Love for Three Oranges, Tchaikovsky’s Nutcracker, and an opera based on Sendak’s picture book Where the Wild Things Are. The exhibition will include nearly 150 objects drawn primarily from the artist’s bequest to the Morgan of over 900 drawings. Sendak borrowed gleefully from a personal pantheon of artists, some of whom he encountered firsthand at the Morgan. Several such works, by William Blake, Wolfgang Amadeus Mozart, and Domenico and Giambattista Tiepolo, will be displayed alongside his designs. Although less well known than his book illustrations, Sendak’s drawings for the stage embody his singular hand, fantastical mode of storytelling, keen—sometimes bawdy—sense of humor, and profound love of music and art history. Drawing the Curtain: Maurice Sendak’s Designs for Opera and Ballet is made possible with generous support from The Maurice Sendak Foundation, the Caroline Morgan Macomber Fund, Rudy and Sally Ruggles, the David Berg Foundation, and assistance from Marilyn J. Friedland. 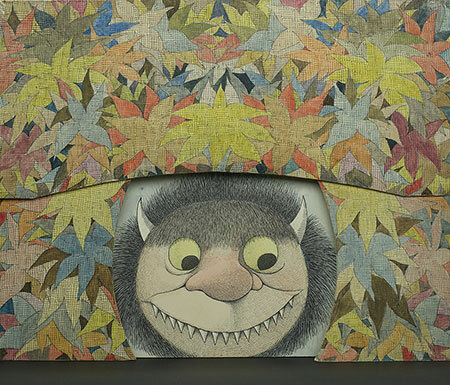 Moishe scrim and flower proscenium portal (Where the Wild Things Are), 1979–83. Watercolor, pen and ink, and graphite pencil on laminated paperboard. © The Maurice Sendak Foundation. The Morgan Library & Museum, Bequest of Maurice Sendak, 2013. Photography by Graham S. Haber, 2018.